Samsung has today launched the latest version of its Galaxy J series of smartphones, the refreshed Galaxy J2 2016, at an event held in Bengaluru. Another device, the Samsung Galaxy J Max, has also been launched. The smartphone runs on Android Marshmallow. The battery capacity of the device is 2,600 mAh. Samsung Galaxy J2 2016 is powered by 1.5 GB RAM and 1.5 GHz quad-core Spectrum processor. The inbuilt storage is 8 GB, which is expandable up to 128 GB via a microSD card. It supports 4G LTE and VoLTE, along with the usual connectivity features like WiFi and Bluetooth. It is a dual SIM (both micro) smartphone. The device comes with a 5.0-inch HD Super AMOLED display, with a resolution of 1280x720 pixels. The proprietary S-Bike and Ultra Data Saving mode are available. The smartphone features a 8 MP rear camera. The secondary camera is a 5 MP shooter. Both these lenses have a f/2.2 aperture. The primary camera lens is surrounded by a notification light which Samsung is calling the Smart Glow Notification. This is a unique place to put the notifier, but we are unsure about its usefulness. If you are the one who keeps your smartphone upside down, only then this makes sense. 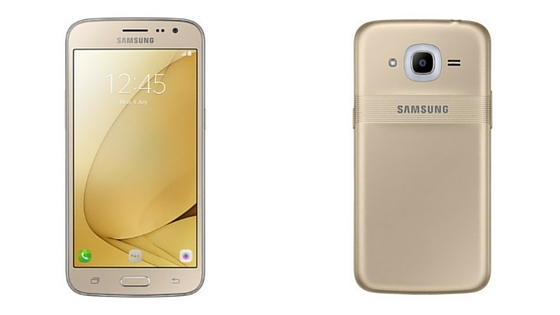 Samsung Galaxy J 2016 comes in black, gold and silver color options. It is priced at ₹9,750 ($145 approx.). It will be available July 10 onwards both online as well as offline.